Paint-party is a social event that lets you try painting in a fun and casual ambience. 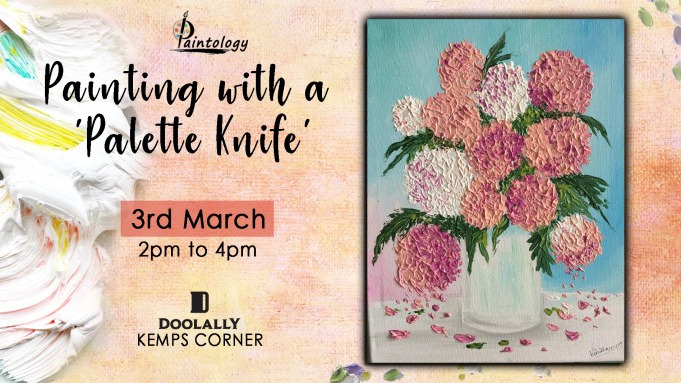 Paintology brings to a knife painting party which will not only de-stress your mind, but will help you create a beautiful painting even if you don’t know how to paint as ‘Art is Therapy’ even if you don’t know how to paint!! Don’t worry it is not a kitchen knife or a butter knife. This is a special artist palette knife which does not have any sharp edges and is only used for painting! In this painting we will be learning the Impasto knife painting technique which gives the painting a 3D look! Impasto knife painting is easy to learn that what it looks like and the bold textures make the painting look magnificent! This social painting makes art more accessible to everyone. Instructions are given step-by-step, which makes it easy for anyone to make a more-than-decent painting that’s ready to take home. Right from art supplies to setting up your easel, everything is taken care off. NO PAINTING EXPERIENCE IS NEEDED. You will be guided step-by-step to paint the beautiful impasto knife painting picture from scratch on a blank canvas. All the painting materials will be provided along with food and beverage worth Rs.300! Come-socialise-paint-munch and take a beautiful piece of art home! Call- 08999344265 for queries. NO LATE ENTRIES STRICTLY. BE AT THE VENUE 10 MINS PRIOR . Share "Peach Blossoms- Impasto palette Knife Painting workshop"